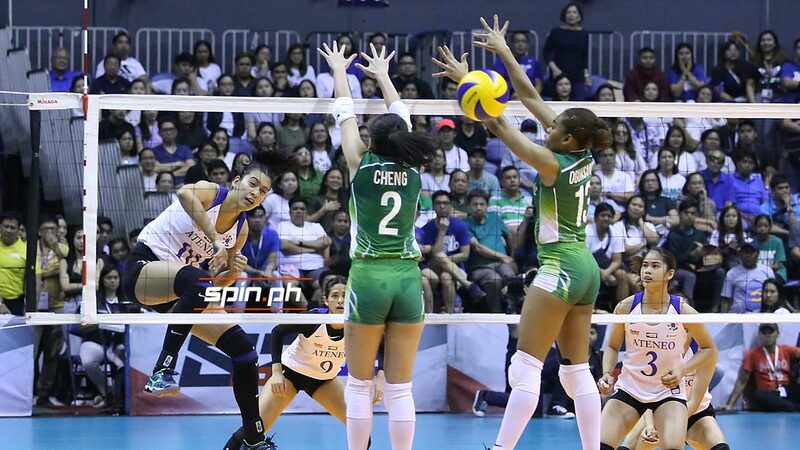 KAT Tolentino took the blame for not living up to her usual performance in their Round 2 clash against La Salle in UAAP Season 81 women’s volleyball tournament. Tolentino, the Lady Eagles’ leading scorer with 15.09 points in 11 games, only had six points in their 17-25, 13-25, 23-25 loss to La Salle that halted their 10-game winning streak on Saturday at the Smart-Araneta Coliseum. “I know, for me, I didn’t contribute the way that I should. So it will only be a learning process for us and we’ll bounce back,” said Tolentino after La Salle completed an elimination-round sweep against them. Nobody scored in double figures from the Lady Eagles with Ponggay Gaston having the best production of seven points, while Tolentino, Maddie Madayag, and Bea De Leon only had six markers each. Ateneo, the league’s best blocking team with 110 kill blocks and 2.62 average by set in its first 11 games, also had no blocks in 27 attempts. “La Salle was prepared. It was a crucial game for them. I think they really came all out and for us, we were really a bit more complacent,” Tolentino said. But the Filipina-Canadian hitter said that this will be a wake-up call for them heading into the Final Four as they only need to win one of their last two matches against Adamson and University of the East on April 24 and 28 to clinch a twice-to-beat advantage. Ateneo will take a Holy Week break before returning to action and the Lady Eagles are looking to get their acts together from there.